Whether to give a book away is not the ONLY question facing authors who have control over such decisions, but it is one with implications. When Amazon first made electronic book self-publishing easy, one of the successful promotion strategies was to give away a book—particularly the first book in a series. Readers were just getting used to eBooks and eReaders and getting one of your books into a reader’s hands was a successful strategy for becoming known. In the early days a free promotion could generate tens of thousands, maybe even a hundred thousand downloads. Fast forward to today and the situation is different. Few people are just now buying their first eReader, so succeeding by getting your book to be one of the first downloaded is like trying to hop on a train roaring down the track at fifty miles-per-hour. Even if they don’t have a dedicated eReader and want to try out eBooks, they can read them on their computer or smart phone. Readers who want free books have dozens of newsletters to provide them links to free books in the genres they prefer to read. The only way for an author to stand out in a crowd is to pay for promoting his book. Many voracious readers belong to Amazon Unlimited or other subscription services, where after paying their monthly subscription, it costs them nothing to read their next book—but unlike free promotions, reading those books provide authors compensation. Lastly, I have an untested suspicion that we have fostered a large group of people who will only read free books (electronic or print from libraries) and will not pay for their pleasure reading. A subset includes people who download stolen books, upon whom I wish the worst of computer viruses. If my primary writing goal was to have people read my books, then free is fine, but I’d like compensation for my writing, which means I need to find readers willing to pay for their reading pleasure. Before Saturday, I focused on reduced-price promotions of my books. I have had limited success with half-price sales or $0.99 sales of electronic books. Whenever I have promoted a sale, my Kindle Unlimited pages read for all the books in the Seamus McCree series increases significantly. I’ve read anecdotal evidence that the same happens when authors give away a book in their series. 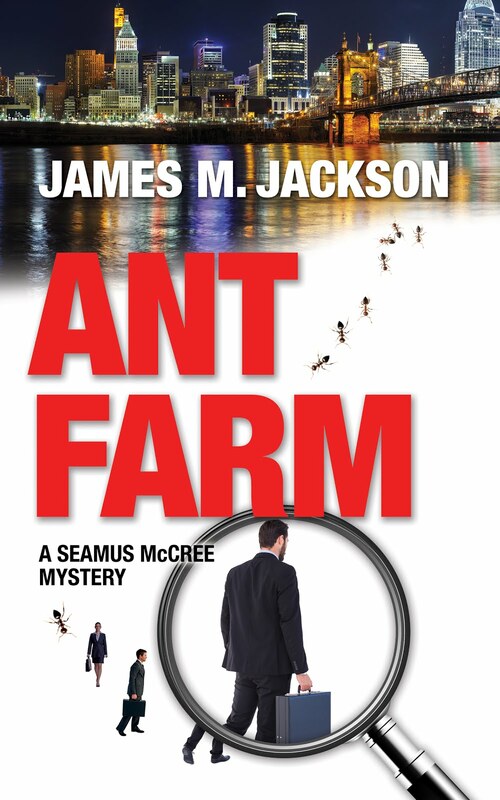 Saturday I began an experiment: I reduced the Kindle eBook price of Ant Farm (Seamus McCree #1) to free for five days (the last day is May 23). I also dropped the price on the second book in the series, Bad Policy, from $3.99 to $2.99. The prices for the other three books in the series remain at $3.99. I’ve taken out ads, will send out my newsletter, and have written this blog. We’ll see how this works. My hypothesis goes something like this: For every 1,000 downloads, say 10% read the book. Of those, say 10% become fans and read the entire series. At current pricing, it costs them $15 to buy the other four books. Under those assumptions, each 1,000 downloads will result in $150 of sales ($100 of royalties). Plus, I expect I’ll end up with more read Kindle Unlimited pages, and I hope the publicity will spur sales of other books in the series to people who have read and liked some but not been motivated to buy the next in the series. Regardless of how it works out, one thing I know is that I will not set up free promotions for the later Seamus McCree novels. It’s one thing to give away the first in the series in hopes of attracting new fans; it is quite another thing to set up readers' expectation that if they just wait long enough, they can get all the books for free. 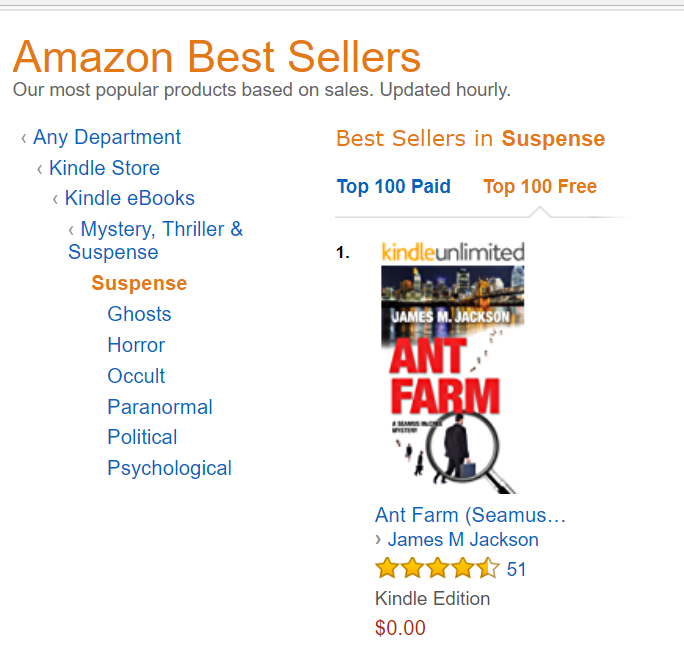 So, if you haven’t read Ant Farm, here is the link to get the Kindle version for free. 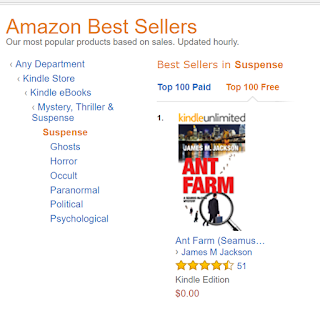 Over the weekend, ANT FARM had 4,552 Kindle eBook downloads. That was sufficient to drive it to Amazon's #1 free book in both the Suspense and Private Investigator categories. The book also reached #22 in the entire Kindle store! The promotion continues through Wednesday 5/23, so feel free to share the good news so others can discover and enjoy Seamus McCree.